It was a pleasure being Chantelle and Kayur's Indian wedding photographer at Froyle Park. Chantelle is the younger sister of Jo, whose wedding I documented some months prior and whose pre-wed shoot I featured earlier. Froyle Park is such a beautiful estate. Incidentally, it was also my first experience here as and Indian wedding photographer. The venue is surrounded by plenty of greenery and backed by a magnificent manor house dating back to the 1600s. It had all the makings for a great event. The Hindu wedding ceremony itself was conducted by none other than Rajubhai, a veteran in the industry. 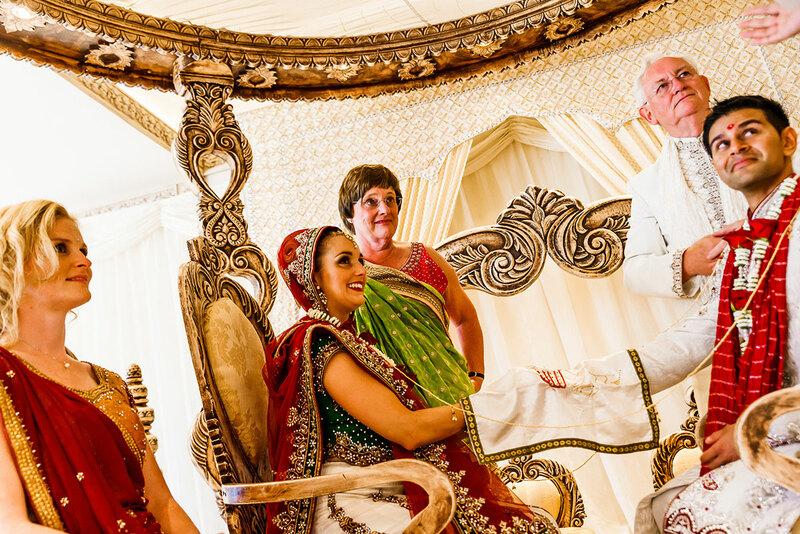 I've worked alonside Rajubhai as an Indian wedding photographer on many occasions. Indian weddings by nature can certainly be a stressful occasion at times. His ceremonies, timekeeping and crowd interaction are at such a high standard. Any apparent stress is diffused in the process. He is simply a great person to work alongside with and it’s always a pleasure when we meet at such occasions. I also got to meet Parita Patel – the Indian wedding planner for the day. Such is her efficiency to coordinate so well, she actually saved 30 mins in time on the day. Anyone familiar with Indian weddings will know that this is quite unheard of and is a testament to her ability in the field. The Hindu wedding ceremony was followed by the Civil wedding and reception. A long day as you can imagine, but charged with laughter and emotion throughout. It made photographing the entire occasion such an enjoyable experience. The reception was a great opportunity for both families to let their hair down following some entertaining speeches. Chantelle (being a cheerleader) took the occasion to new heights (literally) as you’ll see in the pictures! I got to meet a lot of familiar faces from past couples whom I’d previously been their Indian wedding photographer. It's always nice to catch up with old friends. Looking through the full body of pictures, it is clear to see that Chantelle and Kayur are smitten with each other. Individually, they are great people and together they make such a wonderful match. I really do wish them every success with their married life. However, for the moment, I would like to share with you some of the highlights from their big day. I hope you enjoy the images. If you share the same high regard for timeless moments being captured in the most creative of ways then I would love to hear from you. Do feel free to contact me on info@jermainechandra.com or call on +44 (0) 7835 58 22 58. I look forward to hearing more about your plans and how I can capture your memories as your Indian wedding photographer. Incredible images, so distinctive – just one look and I can tell it’s yours! Oh my goodness this looks incredible! So dramatic! So excited to see them all! Stunning capture of two really nice people. Oh wow!!! Such happy memories- brought it all back. Thanks so much Jermaine. Incredible photographs! Thank you so much! We were very blessed with everyone who came and helped us with the day. I can’t thank you enough! Wow. Jermaine, amazing pictures. I absolutely love your very simple and yet humble approach to capturing moments. These are stunning stunning images. The couple were also beautiful natural people. Parita the wedding planer I also a god send and Arti the MUA. Great people. How many times have we worked alongside each other. Thank you also for your kind words about what I bring.